It was grey, wet, cold, miserable, oppressive. The morning commute on the trains in London was the usual: over-cramped, delayed, slow, uncomfortable. Squished in there like sardines, I had my face pressed up against a larger man’s sweaty pits. There was no where else for me to turn, I was caged in by an array of sweaty pits. The train lurched to a complete halt about 100 meters from my destination platform. The familiar, begrudging voice of the train driver came across the intercom, “Apologies for the delay, we’re being held at a red signal. This is due to congestion. Hopefully we’ll be getting you all in to the platform soon. Sorry for any delays this causes you.” We sat there for another 10 mins of agony. This is a true story. It is my commute most mornings. It is many millions’ commutes most mornings. Lately I’ve become rather disenchanted with society (again). I’m frustrated with this rat race to the bottom, working our lives away to make other people rich, while we scrape by with little savings. I’m infuriated by the values capitalism promotes to its people. What happened to love, support, friends, joy, meaning? Why is money on the highest pedestal? And why are we, as a race, so horrible to our own kind? Why are we so vain, egotistical, violent, and power-hungry? Sometimes, lately, I can’t turn on the news, because my heart can’t take anymore. We’re so far removed from where we should be, as a species. We’re so far removed from nature. We were never meant to live in these tiny little boxes, in our tiny borders that create ‘them’ and ‘us’. We like to generalize whole races, countries, kinds, and put them into boxes so that we can understand (or not), but more often judge and discriminate against. This growing feeling of tension has been rising inside of me. This piece was a lash-out at this boxed-nature we’ve become. Dissonance, is a lack of harmony among musical notes. It is a tension or clash resulting from the combination of two disharmonious or unsuitable elements. Though my last piece preceding this one was technically ‘harmony’, I felt the actual outcome was more dissonant than harmonic. The process was equally dissonant (read about it). Tension felt like a natural progression and contrast in this developing piece. a strained state or condition resulting from forces acting in opposition to each other. mental or emotional strain: a mind that is affected by stress or tension cannot think as clearly. a strained political or social state or relationship: the coup followed months of tension between the military and the government | racial tensions. Originally, I wanted to write out my message in blood. I wanted to hammer it home that this way of living is actually killing us. We are suffocating silently in these constraints. But I didn’t have any red paint, nor any ketchup. 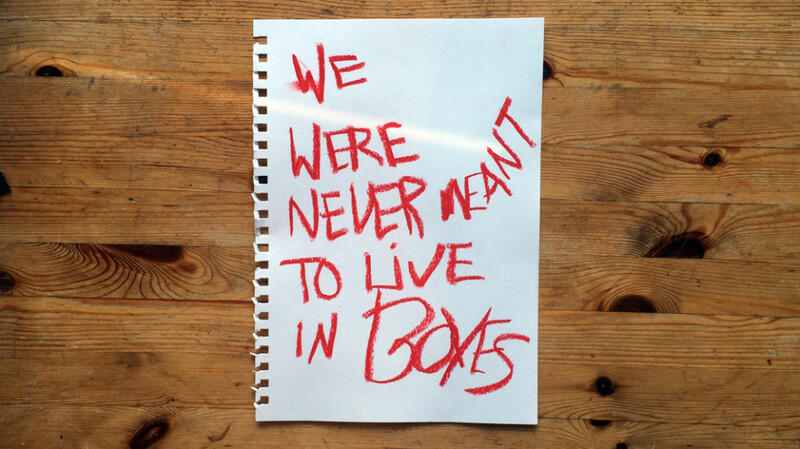 I grabbed the red chalk pastel I’d used in harmony, and wrote “we were never meant to live in boxes” with my non-dominant hand on a torn-out piece of paper from my sketchbook. I tried a second version with black paint, again with my non-dominant hand. In the end I went with my first version. It felt more raw, angry, sharp, tense.